The London taxpayer has been burdened with millions of policing costs surveilling Julian Assange the editor of WikiLeaks with the Metropolitan Police laying a seige upon the Ecuadorian Embassy for years. Covert plan at Ecuadorian Embassy has been strengthened after removing Metropolitan police dedicated guards we are told as it is no longer proportionate. But what about the costs already occurred, are these going to be forwarded to Sweden? The Mayor currently doesn’t think so. The Houses of Parliament have amended the law years ago so that European Arrest Warrants issued for questioning a suspect are no longer valid in the UK. The EAW issued for Julian Assange by Sweden is exactly of that type. 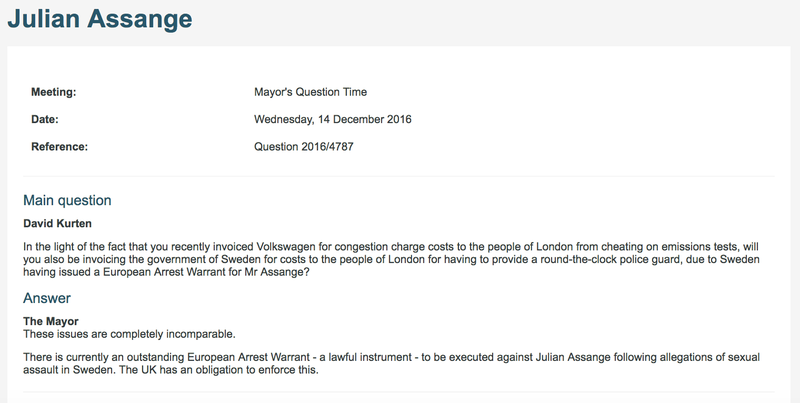 The Mayor though chooses to call it a lawful instrument and that the UK has an obligation to enforce it. Furthermore, Julian Assange has been questioned by the Swedish Prosecutors in November this year, his statement to them can be read here: https://justice4assange.com/assange-testimony, so now that the questioning has taken place what function does the EAW serve? Sweden chose to issue a European Arrest Warrant all those years ago instead of coming to question him in the UK or later at the Ecuadorian Embassy just as they finally did this November. Sweden should compensate the London Tax Payer for all the unnecessary costs occurred. How is it that the London Mayor fails to acknowledge the responsibility he has in this matter? Most importantly, the United nations earlier this year published its finding that Julian Assange has been arbitrarily detained by UK and Sweden since December 2010, they call for his release and compensation. But the London Mayor a human rights lawyer no less, chooses to completely ignore any reference to Julian Assange’s Human Rights. How can the Mayor be credible on Human Rights for London when he so blatantly ignores the Human Rights of Julian Assange?